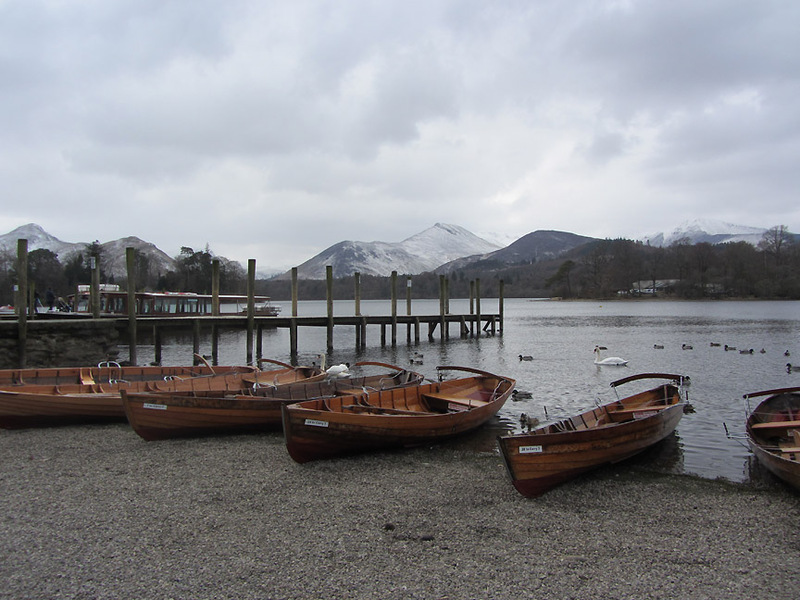 " Keswick and Castle Head "
Date & start time: Monday 25th March 2013, 12.15 pm start. 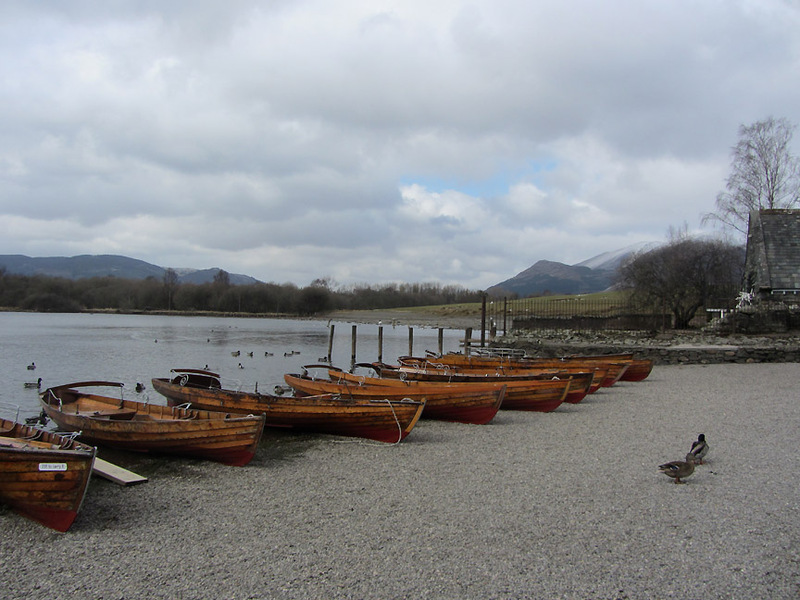 Places visited : Crow Park, Hope Park, Castle Head, the boat Landings and George Fishers. 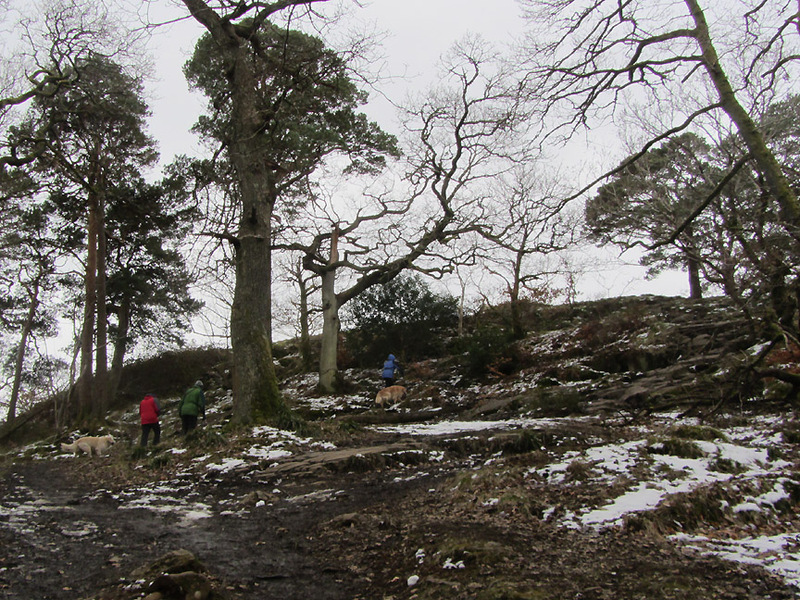 Walk details : 2.5 mls, 375ft of ascent, 1 hour 40 mins until the lunch stop. 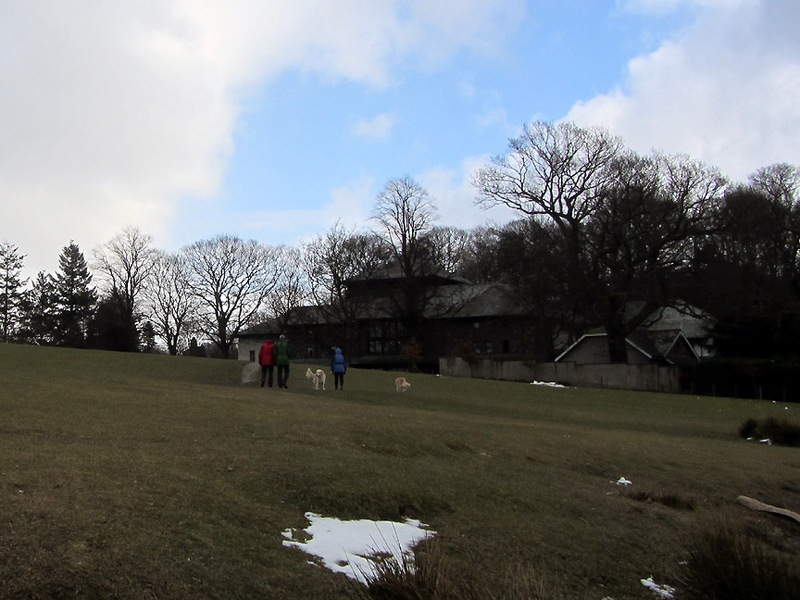 Highest point : Castle Head, 527 ft - 162 m.
Walked with : John and Dee, Ann and the dogs, Amber, Harry and Bethan. 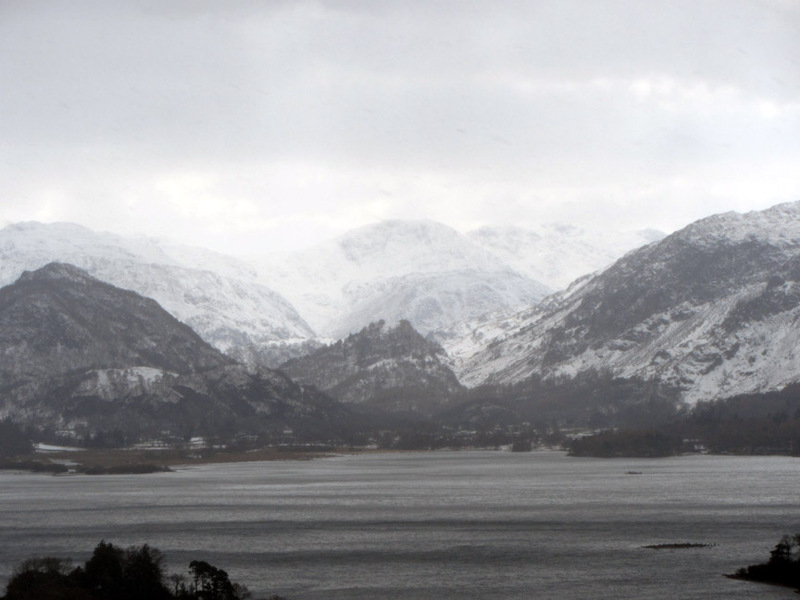 Weather : Overcast, still with that cold easterly breeze. Temp just above freezing. 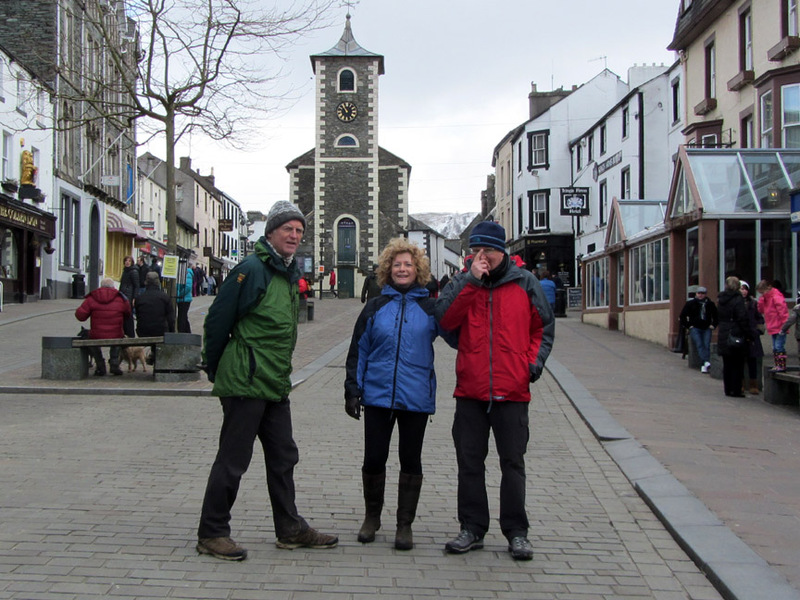 Our friends John and Dee were in Keswick and invited us over for a shorter walk and lunch before they travelled back to Durham. 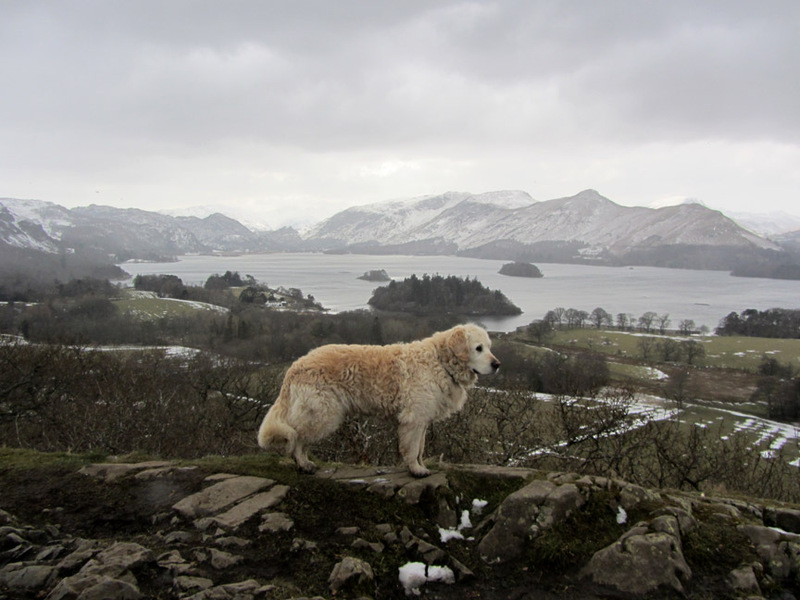 Their dog Amber is thirteen and a half years old (Harry and Bethan's older sister) so can't manage big walks now. 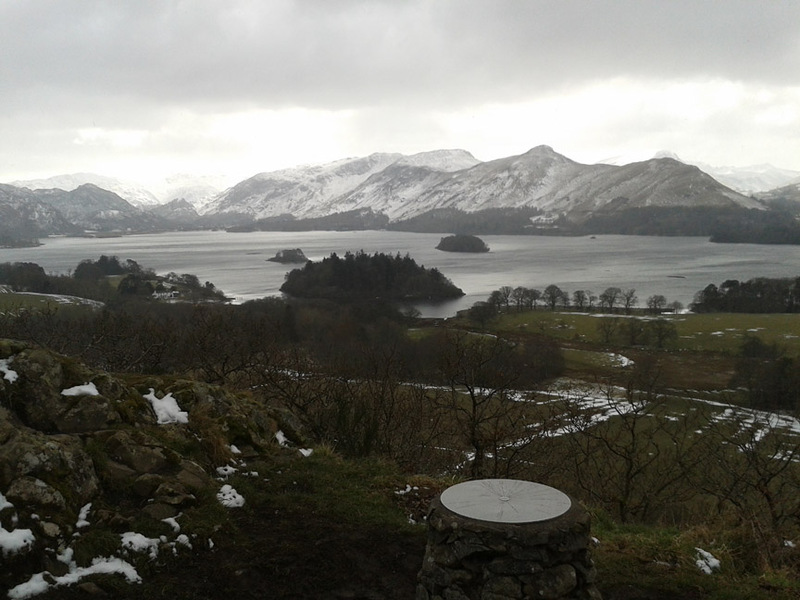 Instead we chose a shorter stroll down to the lake and then up onto Castle Head to enjoy an elevated view of the Keswick area. 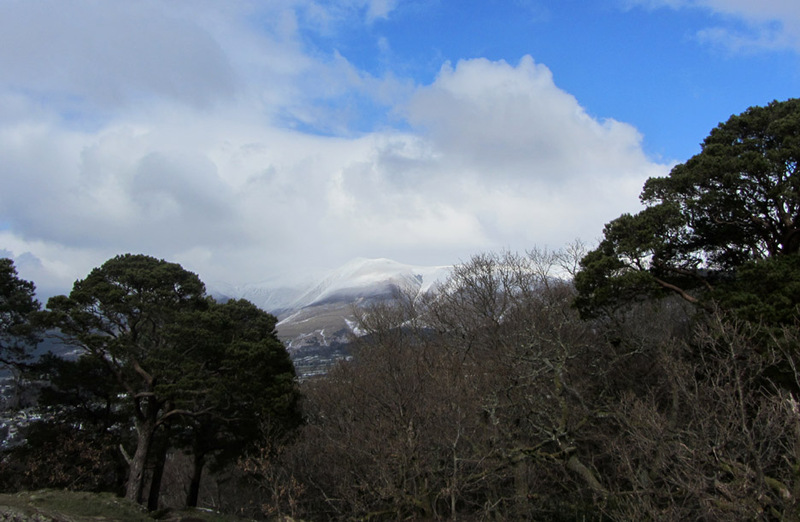 Crossing Crow Park with the snowy outline of Skiddaw behind. Dee receives a phone call just as Ann presses the shutter ! The lack of rain means that the lake level is very low. In wetter times the lake will rise and cover the stones . . . but that won't happen till the rains come and all the snow melts. From the theatre we walked across the car park, through the woods and along the rather slushy path next to the hedge. 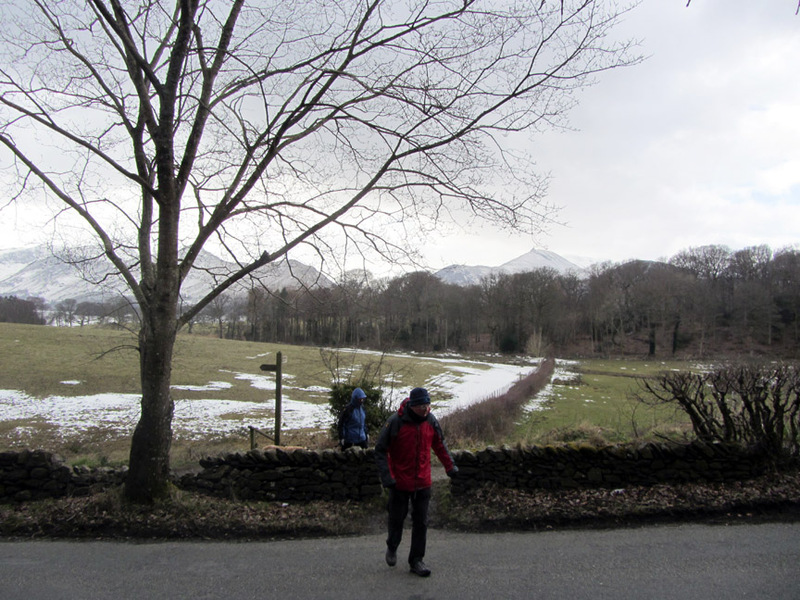 John crosses the Borrowdale Road, from where we all head up into Castle Head Woods. 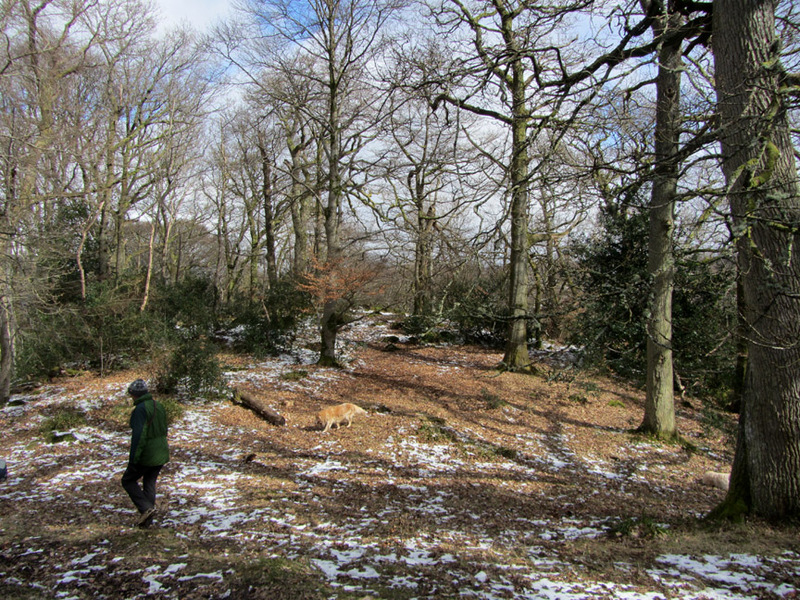 Bare winter trees make the woodland more open to the sky than normal. In the summer this is an enclosed woodland walk under the mixed covering of deciduous leaves and evergreen pine. The view from the top . . . the best value view in the area . . . a great vista after minimum climbing effort. The circular plaque lets visitors know what there is to see from the viewpoint.
. . . but we won't know what because he wouldn't say ! 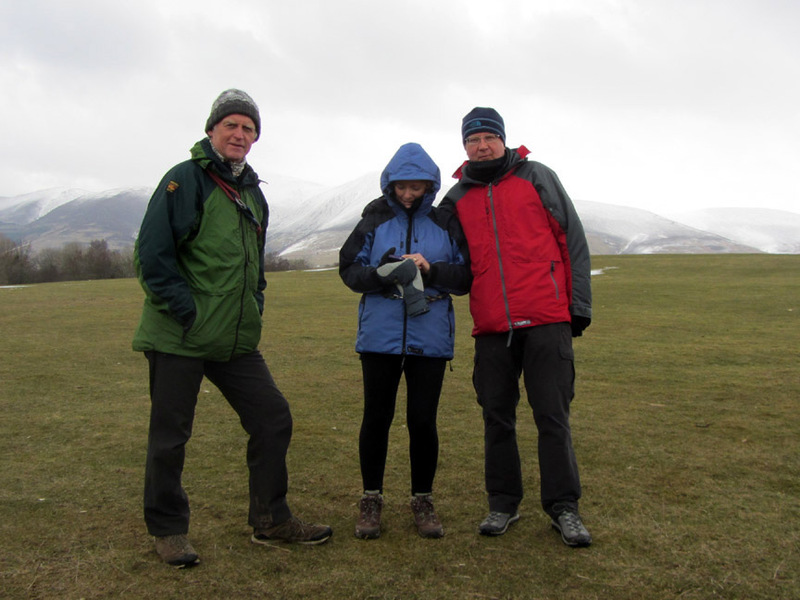 Maybe it was something in the Keswick direction ? 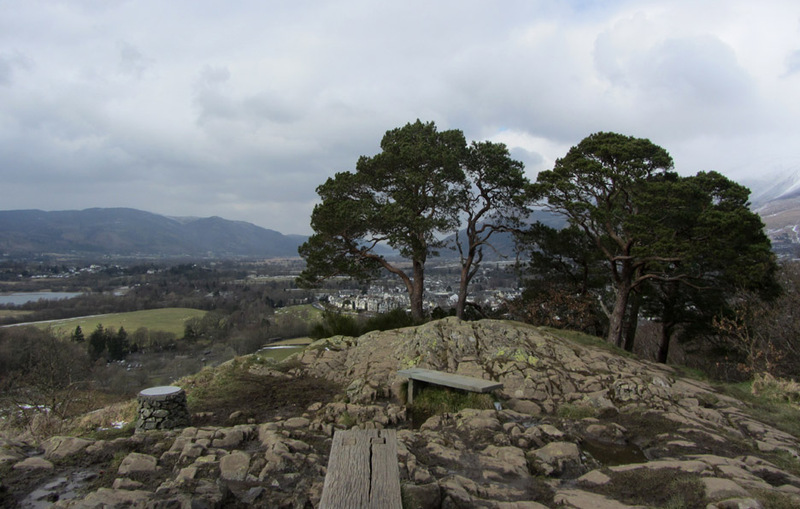 A wider panorama ranging from Shepherd's Crag to the left and Borrowdale with Castle Crag at the head of the lake. 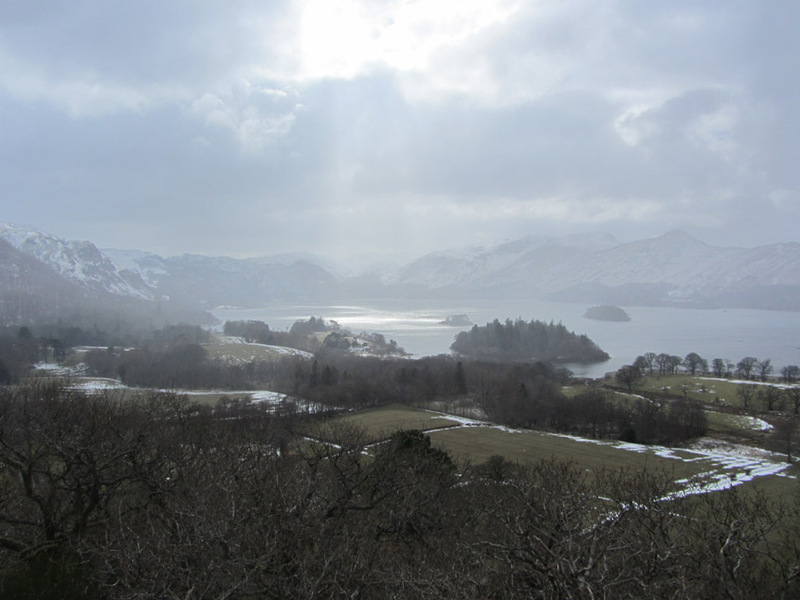 Next is the High Spy / Maiden Moor / Catbells group of fells with Causey Pike and Grisedale Pike to the right. Hat and gloves are called for as a wintery shower, a bit more boisterous than the last, passes overhead. A gap in the clouds as the shower blows through causes a bright reflection on the lake. Zooming in on that most diminutive of Wainwright summits . 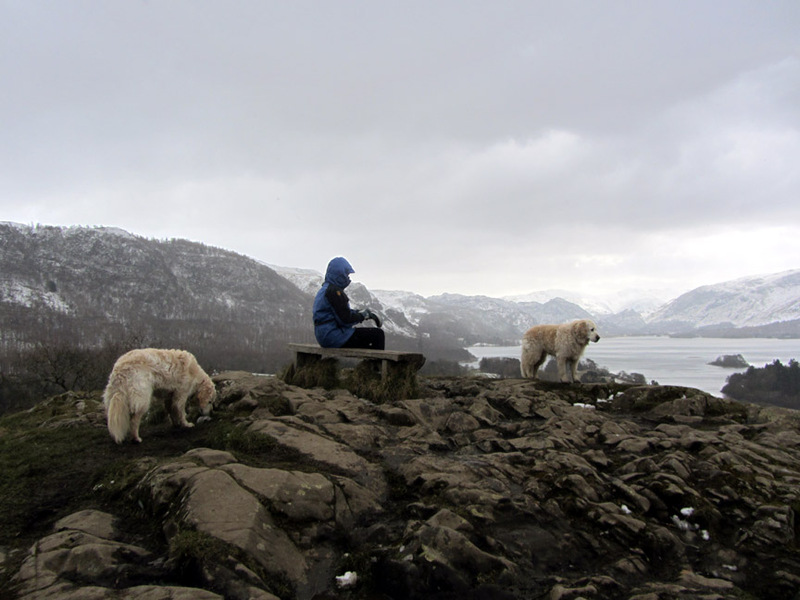 . . Castle Crag. The weather changes again and behind us are blue skies . 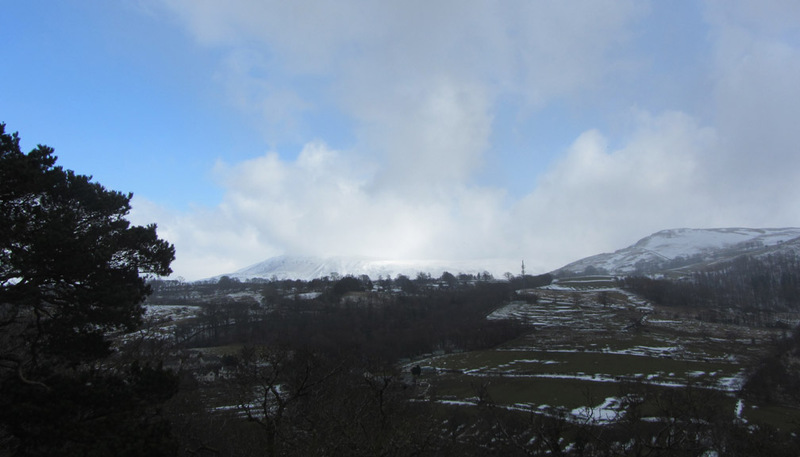 . . but Clough Head is still 'Clough Head-in-the-clouds'. 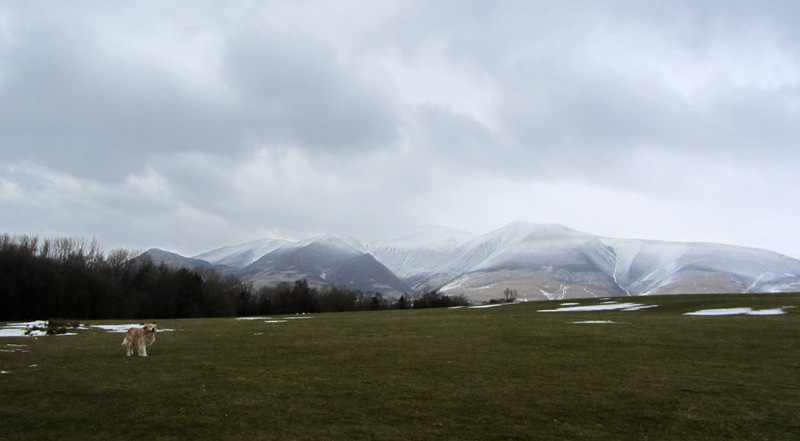 Skiddaw Little Man and Skiddaw are just about clear of cloud. 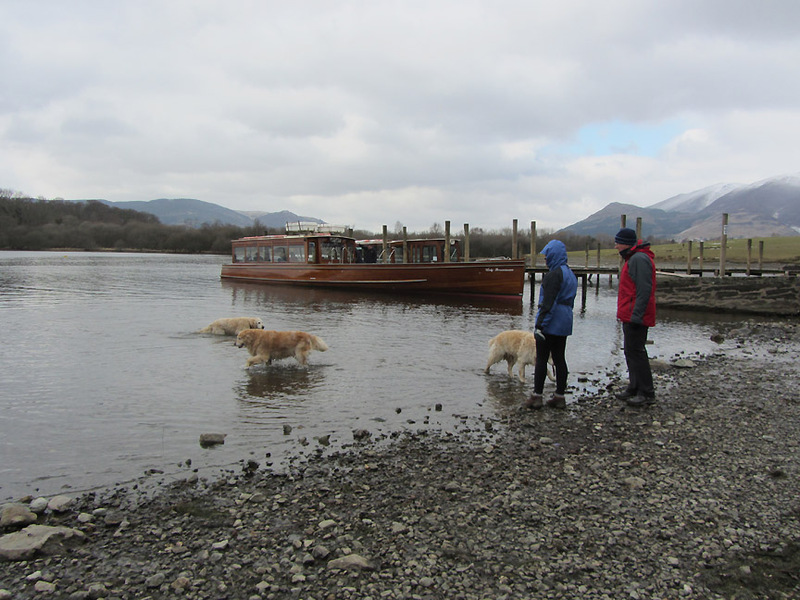 and back to the lake by the most direct route . . .
. . . the path taking us directly to the Boat Landings on Derwent Water. Boat Hire is not the flavour of the day today. The low water means they are beached much further down the stones than usual. In normal times the dwarf wall by the boathouse often has water lapping upon it . 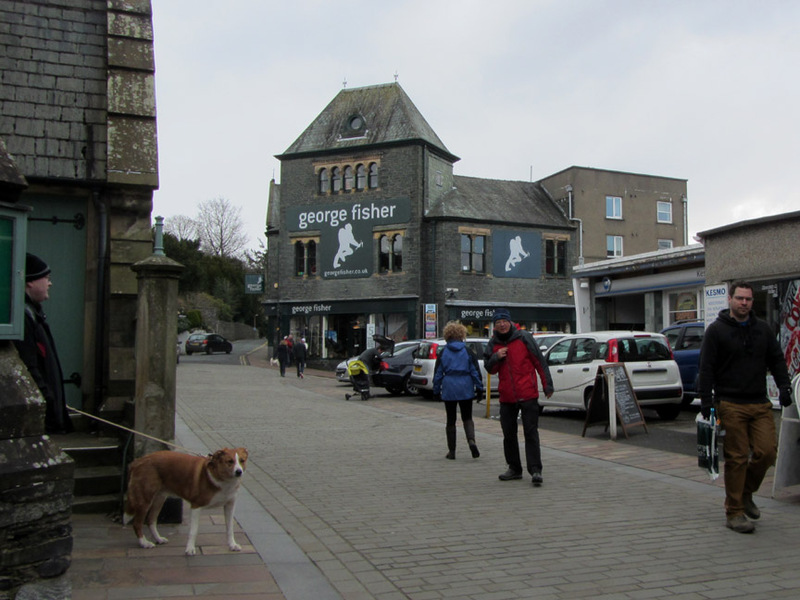 No walk through Keswick would be complete without a picture of the Moot Hall and Market Square. Time for some lunch . . . where shall we go ? Back to work . . . even on my day off . . . oh no ! 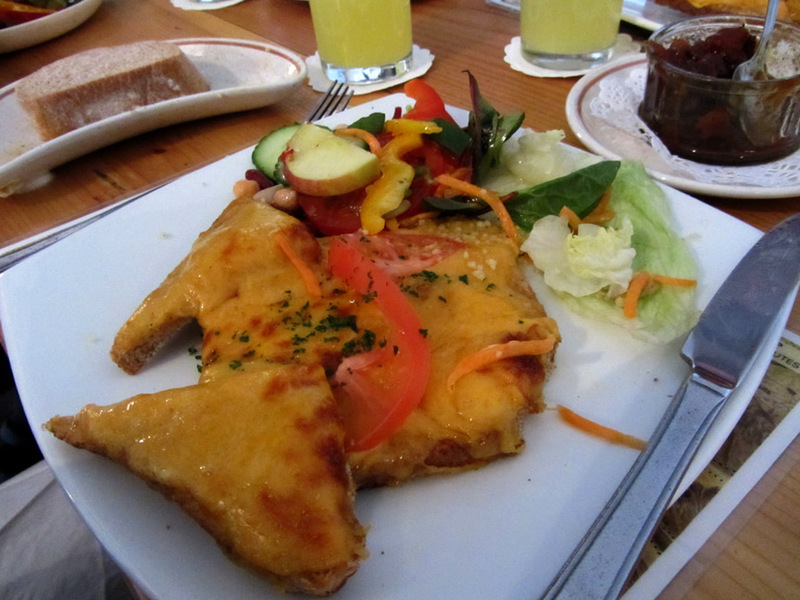 But with a Cumbrian Rarebit on offer . . . who could resist ? Technical note: it comes with four matching corners . . . it was so good I ate two before the camera came out ! This site best viewed with . . . the self discipline to take the photo first and eat afterwards !